After nearly 12 months of foraging microbes, I finally received my first lactic acid bacteria (LAB) isolates! These bacteria are significant because the will ultimately be the forces behind the acid solera beer, a continuous mixture of highly acidic (low pH) beer for blending. Eureka Brewing/Samuel Aeschlimann’s Evaluate Starter Media to Propagate Lactobacillus sp. I highly recommend thoroughly reading each blog post (and blog for that matter!). At a high level, Tonsmiere walks you through a detailed, step-by-step overview of proper pressure canning technique, Aeschlimann explains his method for evaluating alternative starter recipes specifically for LAB, and Miller provides thorough insight into souring with Lactobacillus (including his preferred starter recipe). 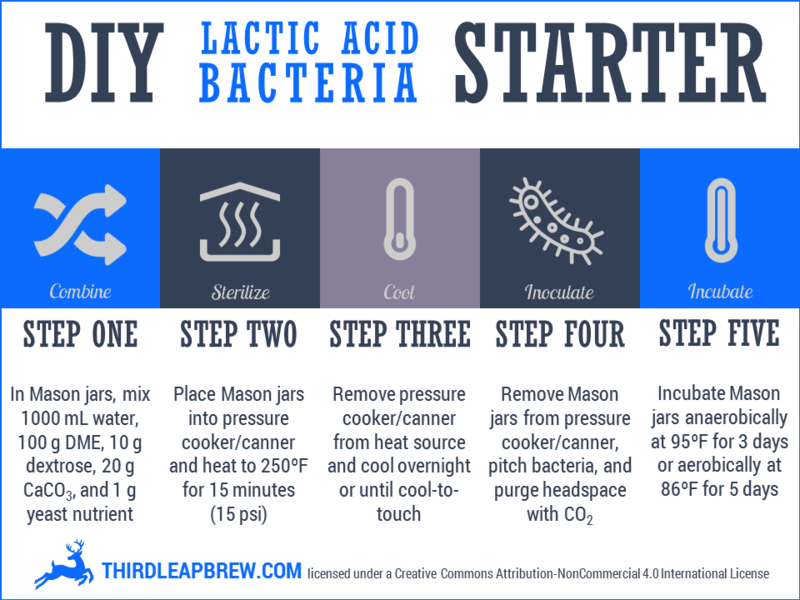 From these resources, I created a quick and dirty sterile method for a DIY Lactic Acid Bacteria Starter! This blog post will serve as the basis for two future posts; Foraged Bacteria Pilot Batch Tasting and Acid Solera. Disclaimer: This process assumes that you have a pure LAB isolate. I highly recommend utilizing a trained professional for isolation services to avoid accidentally isolating pathogens such as Clostridium botulinum, among others. Aeschlimann’s 2015 evaluation experiment examined de Man, Rogosa, and Sharpe (MRS) bacterial growth medium alternatives for propagating LAB at home. MRS is considered the gold standard for isolation, enumeration, and cultivation of Lactobacillus. ; however it is extremely expensive for the average homebrewer ($85 per 500g!). Aeschlimann demonstrated an alternative medium composition of 10°P DME + 10% (v/v) apple juice + 2% (w/v) CaCO3 + yeast nutrient led to growth efficiency close to MRS. For a 1 L starter, this translates to 909 mL water + 99 g DME + 91 mL apple juice + 20 g CaCO3 + 1 g yeast nutrient. I rarely keep apple juice on hand so I substituted it for dextrose (which, coincidentally, is part of the MRS recipe). From my research, apple juice contains 24 g of sugar per 237 mL (cup); therefore 91 mL (per Aeschlimann’s recipe) would contain approximately 10 g. Three simple sugars are found in apple juice; fructose, sucrose, and glucose, however my recipe uses only dextrose (glucose), which is readily available and inexpensive to homebrewers as corn sugar. The rounding of numbers makes the recipe easier to prepare and remember. According to the MRS medium preparation instructions, combine the ingredients, heat with frequent agitation, and boil for 1 minute to dissolve. Alternatively, use a spoon to give the contents of the jars a quick swirl. Transfer the medium into Mason jars. Affix new, unused lids and hand-tighten with the corresponding rings. Commercial sterilization is achieved with an autoclave, however a pressure canner is more practical for the homebrewer. Please be sure to follow your pressure canner instructions! Tonsmiere’s supplementary tutorial is also particularly helpful. For the All American 15 Quart Pressure Canner, start by loading the sealed Mason jars onto the canner rack. Pour 2-3″ of hot water into the canner. Place lid on canner, gradually tightening two opposite wing nuts at the same time. Place canner over heat source on high heat and allow steam to escape from the vent pipe for 7 minutes. Place the pressure regulator weight (set to 15 psi) on vent pipe. Wait until steam begins escaping from the weight, causing it to jiggle and sputter. Reduce the heat so that the weight only jiggle/sputters 1-4 times per minute. Per Aeschlimann and MRS preparation instructions, sterilize the medium for 15 minutes at 250°F (121°C). After 15 minutes, turn the heat off and remove the pressure canner from the heat source. Let it sit overnight, undisturbed (don’t open the lid or even remove the weight!). If you are in a hurry, let the canner cool until it is comfortable to touch with your bare hands. Once cooled, remove the weight to release any remaining pressure in the canner. Remove the lid, revealing the sterile Mason jars. Discard any jars which are not vacuum sealed (confirmed if the lid flexes when depressed). Remove the remaining jars. Sequentially pop off each lid and inoculate the cool, sterile medium with your bacteria. LAB prefer anaerobic (oxygen free) growth conditions, but they can also grow in the presence of oxygen (just not as rapidly). Therefore, if possible, purge the head space of the Mason jar with CO2 before affixing the lid and ring. Becton Dickinson (BD) recommends incubating MRS anaerobically at 95°F (35°C) for 3 days or aerobically at 86°F (30°C) for 5 days. Maintaining these temperatures typically requires the use of a heating plate/pad or temperature controlled water bath. While not ideal, the medium can be grown anaerobically at room temperature for a longer duration. Aeschlimann demonstrated that LAB grow “very well” in both MRS and his alternative medium under these conditions over 7 days. And there you have it! If you use my medium recipe, feel free to let me know what you think!